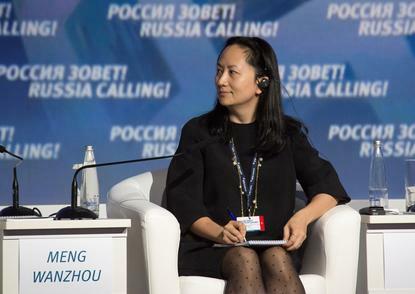 Huawei Technologies Co Ltd's chief financial officer faces U.S. accusations that she covered up her company's links to a firm that tried to sell equipment to Iran despite sanctions, a Canadian prosecutor said on Friday, arguing against giving her bail while she awaits extradition. The case against Meng Wanzhou, who is also the daughter of the founder of Huawei [HWT.UL], stems from a 2013 Reuters report about the company's close ties to Hong Kong-based Skycom Tech Co Ltd, which attempted to sell U.S. equipment to Iran despite U.S. and European Union bans, the prosecutor told a Vancouver court. The hearing did not name any banks, but sources told Reuters this week that the probe centred on whether Huawei had used HSBC Holdings <HSBA.L> to conduct illegal transactions. HSBC is not under investigation. Reporting by Julie Gordon in Vancouver and Steve Stecklow in London; Additional reporting by Anna Mehler Paperny in Toronto, David Ljunggren in Ottawa, Karen Freifeld in New York, Ben Blanchard and Yilei Sun in Beijing, and Sijia Jiang in Hong Kong; Writing by Denny Thomas and Rosalba O'Brien; Editing by Muralikumar Anantharaman, Susan Thomas and Sonya Hepinstall.